The ranks of librarians have included many famous names, from Ben Franklin and J. Edgar Hoover to Mao Tse-tung and Casanova. Fiction also has its share. There’s the brainy Bunny Watson (played by Katharine Hepburn) in the 1957 film “Desk Set,” and Rupert Giles (portrayed by Anthony Stewart Head), Buffy Summers’ mentor in the “Vampire Slayer” TV series. But when Pat Partovi is asked who steered her toward a career among book shelves, she cites a more modest mentor: her college roommate. Partovi went on to earn a master’s in library science, moved to Spokane in 1994 and was named library director in 2005. 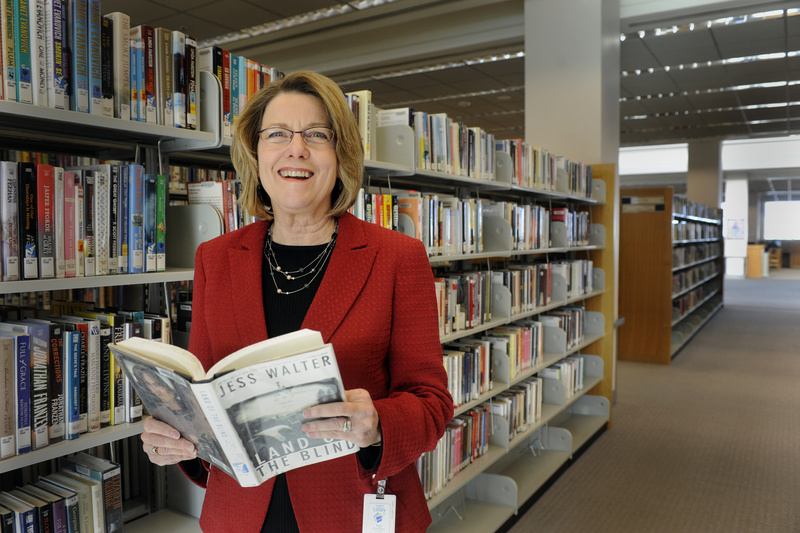 During a recent interview, she described how libraries have evolved during her 35-year career, where they’re headed, and the importance of next month’s levy election. S-R: Do you remember the first book you bonded with? Partovi: One that pops to mind is “The (Wonderful) Wizard of Oz,” which is actually a series of about 10 books. The town where I grew up – Carlsbad, Calif. – had a children’s reading program, and I devoted one whole summer to the series. S-R: What was your first library job? Partovi: I was a children’s librarian for San Bernardino County. It was a blast. S-R: When did you get into management? Partovi: Pretty quickly. I’ve been a library manager most of my career. S-R: What brought you to Spokane? Partovi: The new downtown library. My husband and I were ready to leave Southern California, and Spokane was looking for someone to manage the new branch. We came up here, looked around and loved it. S-R: How has the mission of libraries evolved? Partovi: The way information is delivered has changed, but the basic mission – to provide access to information and promote literacy – hasn’t changed much. Librarians used to be gatekeepers of information, and now we’ve really thrown those gates open. We’re more focused on customer service, and less on protecting the collection. S-R: How did that former protector role manifest itself? Partovi: Soon after I arrived, the symphony started a program called Lunch and Learn, where (KPBX’s) Verne Windham would interview guest artists. During one of those, (baritone) Thomas Hampson and Verne shared how they used to get records from the old downtown library. And before they could have check-out privileges, they had to bring in the needle from their home phonograph and let a librarian examine it. S-R: When did library “patrons” become “customers”? Partovi: Jan Sanders instituted that change when she became library director in 2001. There’s a new movement now that I like better that refers to customers or patrons as “members,” with the inclusiveness that implies. You have to be a member to have a card. S-R: What has been one of the biggest improvements in service? Partovi: A computerized catalog. Customers enjoy browsing it at home, placing items on hold and then coming in to pick them up. S-R: Has anything gotten worse? Partovi: Money is a constant struggle. S-R: What is the Spokane Public Library’s mission today? Partovi: Essentially to strengthen the community by promoting literacy and providing access to information. S-R: Libraries are also warm places to come on a cold day. Is that part of your mission? Partovi: The library is here for people to use any way they choose within our range of services. If they want to come in and read a magazine, they’re welcome to. We have rules of conduct, and for the most part people are good about following those, because they’ve got a pretty good thing going here – it’s comfortable and we have reading material. And there are computers. The digital divide is very real. You can’t do anything without access to the Internet. You can’t apply for unemployment without going online. S-R: Has that changed who uses the library? Partovi: It really has. Providing Internet access – including Wi-Fi access – has become a core service of public libraries. S-R: What does the library of the future look like? Partovi: That will depend on available funds. One thing libraries would like to offer is “maker spaces” – places where, for instance, students can create video documentaries rather than simply write research papers. S-R: Are there fewer books in Spokane libraries today than10 years ago? Partovi: I’d say slightly fewer. We don’t buy the expensive reference materials we used to buy. S-R: Nonpayment of fines has been an issue in the past. Will e-books eliminate fines? Partovi: Yes. E-books check out for three weeks, then expire from your device, so they can’t get lost or damaged. And they’re never overdue – which frankly has a budgetary impact on the library. The e-books cost more, and we’re going to lose fine revenue. We don’t like to charge fines, but the revenue helps. S-R: How would you characterize the library system’s health today? Partovi: It’s precarious. The library has had budget cuts and budget challenges as long as I’ve worked here – 19 years. In 1995, we laid off three people and eliminated scholarship and resume help, and grant-research assistance. The next year, library staff took 12 furlough days (to avoid more layoffs). Since then, our share of the city’s general fund has steadily gone down. Those are the challenges we face, and why we’re looking at this levy. S-R: What services are you most eager to improve? Partovi: The library board’s highest priority is to provide better hours at the East Side, Hillyard and Indian Trail branches. Those libraries are only open four-and-a-half hours a day now, and the hours are inconvenient for a lot of people. We would like to do a better job of serving those neighborhoods. S-R: Next month, Spokane voters will be asked to approve a property-tax increase – 7 cents for each $1,000 of property value – to help fund library services. What will a positive election outcome mean for Spokane libraries? Partovi: We’ll be able to expand service at East Central, Hillyard and Indian Trail to 40 hours a week, and maintain those services for the duration of the four-year levy. The board would use that time to reach out to the whole community to see what level of serve people want and how to fund it. S-R: What advice would you offer someone considering a library career? Partovi: That’s a tough one. I don’t think anyone knows what the future holds for libraries. Anyone going into this career should probably be interested in administrative functions, because a lot of librarians don’t want to have anything to do with supervising people. S-R: Who’s your favorite librarian, real or fictional? S-R: The former Seattle librarian, author and literary critic. Why her? Partovi: She has been a crusader for training librarians to help customers find the perfect book, which is whatever satisfies what you need right now in your life. And she gives you the freedom to give up on a book if it’s not right. She has a rule I just love: 50 pages into a book, if you’re not into it, forget about it – you don’t have to read it.